* Purchased on my own. Cynthia Hand's take on angels definitely isn't like the others--and I mean this in a completely positive way. Admittedly that was one of my fears going into Unearthly; was I going to be bored stiff by the same repetitive angel mythology? Happily, I was pleasantly surprised by it and well, now I'm hopping about while waiting for the next book to come out! Clara's recently begun to have visions of her purpose as an angel-blood and they take her from California to Jackson Hole, Wyoming (a place I've actually been to and personally loved) in search of a boy she's only glimpsed in said visions. Enrolled in her new high school Clara makes friends with Wendy and Angela and she's rather put off by Wendy's brother Tucker (known to his friends as Tuck) who seems to have it out for her. She learns that vision boy's name is Christian and knowing that he's a big part of her purpose, she seeks him out. Although Clara knows that Christian is her purpose she can't help but notice Tucker isn't as bad as she thought he was and as things progress, there's a new contender for Clara's heart. Alright, I know I just made it sound like Clara must fall for one of the guys and well, she does. Actually, I'd say she falls for both a little and then falls for one completely. Which one am I talking about? Can't tell you that! I will, however, say that I love the combination of Clara and Tuck--the level of adorableness is at an all time high--and well, Christian isn't exactly out of the picture. In this particular case, I wouldn't be able to pick a favorite minor character to rave about because it's really a tie between Maggie (Clara's mother) and Wendy (because best friends stick together, even when they do have fights). Clara herself is pretty amazing too--and not just because of her abilities. I mean, the girl is determined to learn how to fly and she's really waiting (and trying to prepare as best she can) to carry out her purpose--well, trying to go along with the vision as much as possible at least. I'm really hoping that in the next book Cynthia will go more in depth about Maggie and well, the Black Wings (although I am suspecting that Black Wings will play a big part from now on) as well as the different types of angels in general. Meanwhile, I shall satisfy myself with pondering about why Christian and Clara meet one another in the vision and the significance that it'll play later down the road. Seriously though, I enjoyed reading Unearthly. Cynthia's writing style was easy to read, there was just the right amount of romance (in my opinion), and it introduced the cast of characters wonderfully--although that's one heck of a discovery at the end of the book! 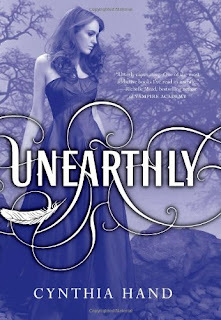 If Unearthly sounds like your sort of book, well, I'd say go for it and pick up a copy! I'm totally Team Tucker - but Christian is definitely hot in his own ways too. :) Great review! I actually fell for Christian, but everyone else I know is on Team Tucker! this one sounds so good, i loved your review! This is a really great review. I'm so glad you liked it!! One of the best books I've read in a long time. Hi there! I'm just going through my dashboard and visiting all the blogs I follow. I've heard lots of good things about this title! I'm looking forward to reading it! I cannot wait to get my hands on this one! I too have heard numerous good things about this one! Awesome review, 5 stars so it must be amazing! Perhpas if you have time, would you mind stopping by my blog?